Monthly calls to the Helpline in 2016 ranged from a low of 881 in May to a high of 1,468 in January. The Helpline report shows the average debt of callers was over $38,000 among those willing to share that information. 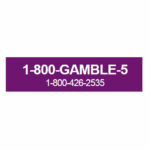 In addition to the more than 13,000 calls to the Problem Gambling Helpline in 2016, the WCPG website also registered more than 8,600 hits and 19,000 page views. Blozinski said 31 used a newly-established Chat Line. Blozinski noted that not all problem gamblers are adults. “Twelve to twenty percent of our youth are showing that they may have some kind of a gambling problem,” she said.